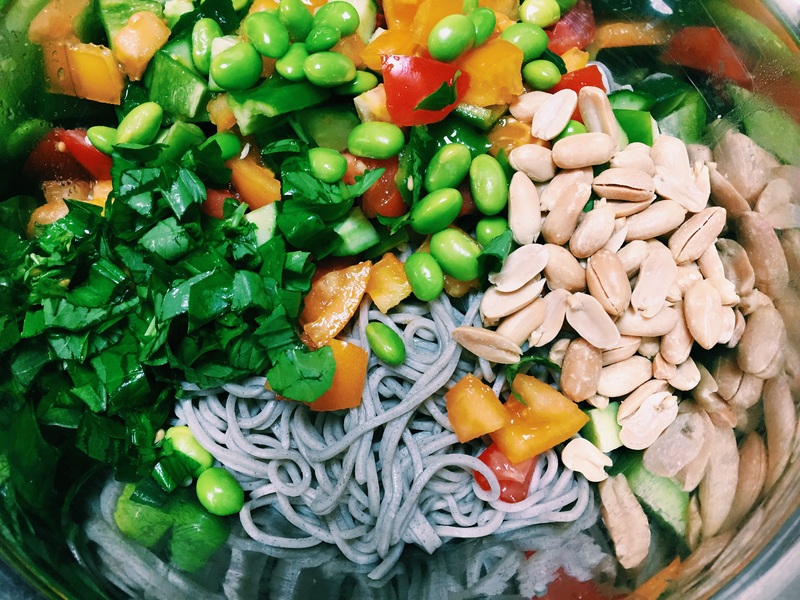 Soba noodles offer a low-cal alternative to wheat pasta. A cup of cooked soba contains 113 calories whilst white spaghetti, on the other hand, contains 220 calories per cup, and the whole-wheat variety contain 174. So, if you eat pasta three times per week, switching from white pasta to soba noodles will save you over 16,692 calories annually, or the equivalent of about 5 pounds of fat. True story. Soba is probably my favourite Japanese food of all time. It’s super healthy and versatile. This salad is so simple and so delicious you’ll be foolish not to try it! 1 large yellow tomato (diced, small) -or alternatively, yellow capsicum. You see, presentation is just as important as taste! Cook soba as per packet instructions, let cool. Dice and chop errythang then mix through soba. Sprinkle with extra sesame seeds to finish. Refrigerate before nomnom for extra yumness.